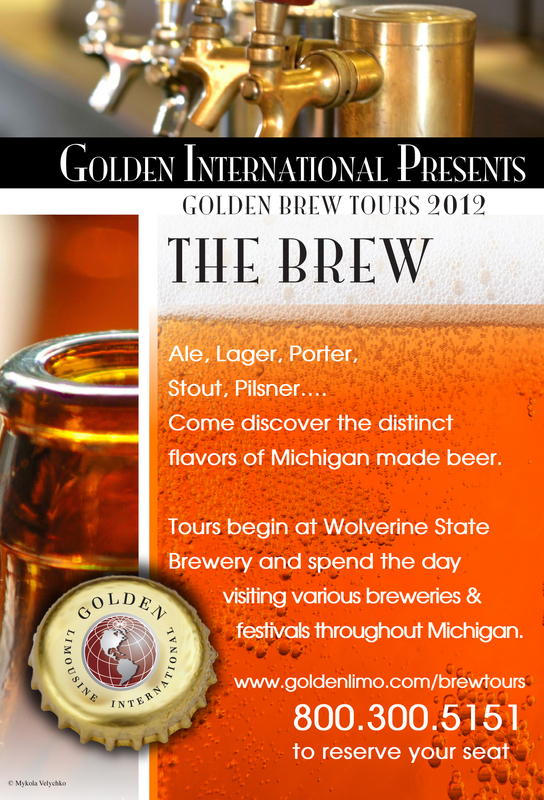 On April 21th, at 12pm, a Golden Brew Tour will begin at the Wolverine State Brewery, 2019 West Stadium Boulevard, Ann Arbor, MI. 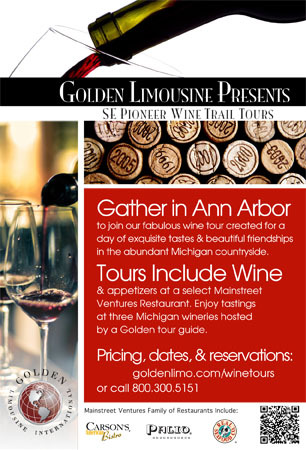 This tour, provided by Golden Limousine International, was designed to introduce Wolverine State Brewery and various Detroit Breweries to the tour attendees. 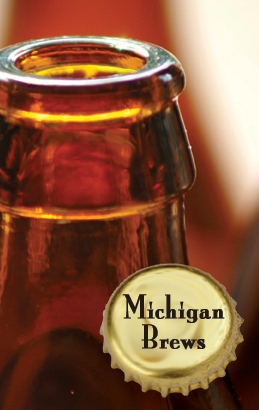 The Brew Tour is a new creation by Golden after many requests by previous attendees of successful Golden Adventures that wish to experience other Michigan made treasures. A beginning, at one of Ann Arbor’s landmark restaurants, with wine and appetizers sets the tone for an ideal Michigan made tour. The next wine tour begins at Palio, 347 South Main, Ann Arbor, MI, on March 24th, at noon. Jon Gould, District Manager of Mainstreet Ventures Ann Arbor restaurants Real Seafood Company, Palio and Carson’s American Bistro, offers this perfect description of the tours. Golden Limousine International is a Michigan based company searching to partner with other Michigan businesses in the promotion of the Great Lakes State to local and international travelers through their adventures. “I love the Golden Wine Tours, and look forward to another trip with Golden this spring. I can’t say enough about the wine tour: easy-going with a skilled driver, a wonderful ride, and the opportunity to try a variety of vineyards’ offerings without worrying about the driving. See you again soon!” Mary Christianson, Ann Arbor, MI. Golden Limousine International provides superior service experiences to a worldwide clientele while acting as a responsible, reliable and trustworthy partner in the delivery of high quality transportation, entertainment, and tour options. More information about the company can be found at http://www.goldenlimo.com or by calling Maya Adrine at 800.300.5151.